We’ve had a spate of shabby chic desks of late. But here we were asked to do just a paint job for a desk job. This particular desk was certainly looking a bit tired before its paint job makeover. But there was no overlooking the fact that the desk had potential. Some intricate carving at both upper and lower levels made for a very distinctive look. 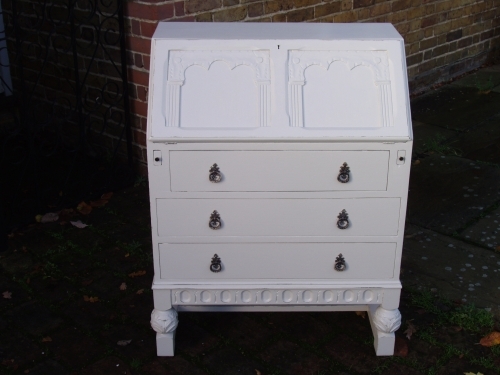 Additionally the drop handles were in good condition and very suitable for this vintage bureau. The drop down desk flap needed a bit of repair. This was relatively simple once we’d removed the top flap and managed to access all the hidden mechanics. Each of the three drawers was in good order but the back panel of the desk needed some tacks. That done, we moved onto the painting. We sanded down the old wood that had been painted with a gloss paint at some stage in the past. We followed up with two coats of undercoat. And then followed that with top coats of Farrow and Ball Skimming Stone in the eggshell finish. The desk needed several coats of Farrow and Ball paint to fully cover underlying wood marks and stains. This isn’t unusual for old pine desks and we typically expect it with older wood. This was an enjoyable painting job giving this particular desk job a new lease of life. The desk is now destined for a new life in a student’s room so we’d expect this desk job to be relied upon for some time yet. 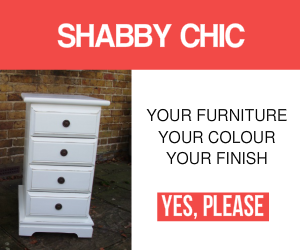 Of course, when you have a piece of furniture that you’d like to be painted then please don’t hesitate to get in touch. Because we can always discuss paint choices, paint finish and any choice of wax treatment.